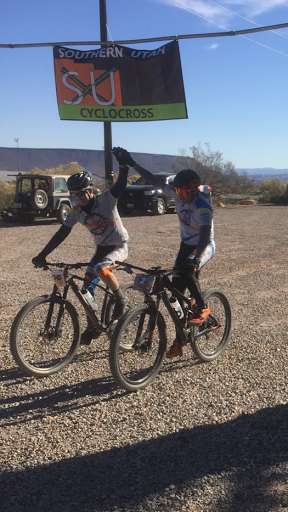 IBB Cyclery and Multisport: IBB Rider Josh Onarheim wins Southern Utah CX Series Cat A! IBB Rider Josh Onarheim wins Southern Utah CX Series Cat A! Huge Congrats to IBB-Orbea Rider Josh Onarheim for winning the overall Series title in the men's Category A Division (aka the 'fast-guys' division). On his way to winning the series Josh finished 1st in the third race at Santa Clara Park, and them 2nd in the fourth and final SU CX race at Gubler park last Saturday to clinch the top podium spot in the series. Selah, age 5, raced in the girls/boys 10-14 division racing 20+ minutes each time out. She completed 3 laps and never gave up! Determined to "do it herself" she carried her own bike over the barriers each time without help from us adults. So proud of her, she truly had a blast out there!